New laws could be introduced to protect women from harassment outside abortion clinics, the Home Office has said. An assessment of protests held outside clinics has been ordered by the home secretary, following concerns about the tactics used by some protesters. Amber Rudd said it was "unacceptable" that anyone should feel intimidated for accessing healthcare. But anti-abortion campaigners said it was "ludicrous" to suggest new powers, because women were not being harassed. The Home Office review will hear from police forces, healthcare providers and local authorities to understand the scale and nature of anti-abortion protests. It will then consider what further action the government could take to protect those using or working in abortion clinics. This could include bolstering existing, or creating new, police and civil powers, the Home Office said. Ms Rudd said: "While everyone has a right to peaceful protest, it is completely unacceptable that anyone should feel harassed or intimidated simply for exercising their legal right to healthcare advice and treatment. "The decision to have an abortion is already an incredibly personal one, without women being further pressured by aggressive protesters." She said the review would provide "firm recommendations" on action to tackle the problem. The police already have a range of powers to manage protests, with the law providing protection against harassment and intimidation. The Home Office said protesters were subject to the law and all suspected offences "will be robustly investigated". Labour MP Rupa Huq, who has campaigned for a law change, welcomed the review with "cautious optimism". In her Ealing Central and Acton constituency, the council backed a proposal in October that would ban protesters from gathering outside an abortion clinic. 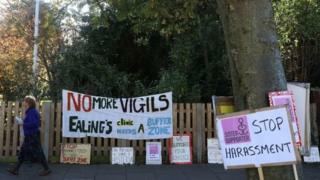 The demonstrators, who hold daily vigils outside the clinic, deny harassing women. Ms Huq said a radial zone to exclude protests within 150m was needed, banning silent praying, singing hymns, displaying foetus images and leaflet distribution. "The complete anonymity of women seeking terminations should be protected as one would expect with any other NHS procedure," she said. But Antonia Tully, director of campaigns at the Society for the Protection of Unborn Children, said: "It is completely ludicrous to suggest introducing new powers to stop small numbers of peaceful people praying outside abortion clinics and offering leaflets to women. "Women are not being harassed. "Pro-life counsellors cannot force a woman not to have an abortion." She said the presence of vigils can be a "lifesaver" for women under pressure to abort. Policing minister Nick Hurd has written to the national policing lead for protest, Deputy Chief Constable Rachel Swann to begin the work. The review will be conducted by Home Office officials and will also consider international comparisons in Australia, France and the US.